Something important came up yesterday and I wasn't able to post, so I am double posting today. I am particularly pleased with the titles this time. This one below is "Halved to Make a Pear." I thought'of 'em all by myself. : ) The photos aren't great ... not sure what I did wrong but I'll repost them later. 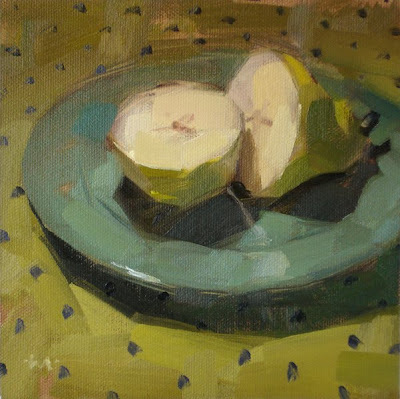 mmmm two in one post...I am a pear freak....love to paint pears, eat pears,,,I´d have to say a pear is my favorite fruit and you have done them proud....like them both. I like clever titles and I like to letter them as borders on some of my paintings. Re: 'Pears'. I did 2 paintings. 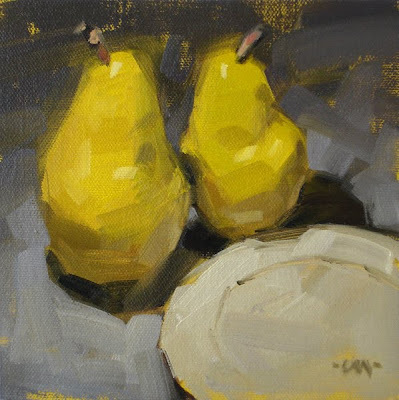 Each had a pair of birds and a pair of pears in the composition and each was titled "PAIRS." On the second painting I included a pair of collage elements of the Eiffel tower and was frequently asked the cost of the painting called "PARIS." You are incredible. You miss a day of posting so you post two the next day! Wow. I need to head to my studio. Pears are one of my favorite subjects and I a chuckling at the titles. I can imagine the grin on your face when you came up with them! Carol, You do come up with the best titles! You could write a book on that. 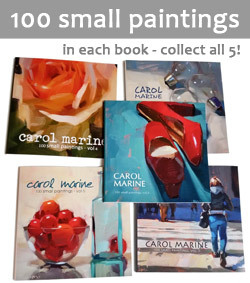 I just organized an exhibit for 150 local Santa Barbara artists painting for the environment. I titled my barn painting "Open Door policy" Info on my blog!